Join me in Rapid City, SD on May 8, I’ll be at Vita Sana Olive Oil Company, 627 St. Joseph St from 11:00 – 12:30 for an informal “Meet and Greet.” With over 42 fusti, containing different Extra Virgin Olive Oils and Balsamic Vinegars, we’ll have fun tasting and talking about my favorite subject, olive oil. Join me for a special Olive Oil Tasting at The Olivina - a beautiful, unique olive tree estate. Learn tips about olive oil in the kitchen and for beauty. Taste award-winning from San Miguel Olive Farm. 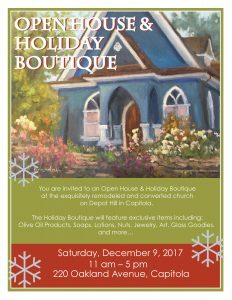 Join me for olive oil tasting, a book signing and discussion of olive oil tips. Join me at the 13th Annual Carmel Valley Art & Wine Celebration. I'll be at the Quail & Olive. I will be speaking at the Annual Italian Family Festival. Check back for times. The Street Festival is a free, family event that showcases Little Italy San Jose and showcases Italian Arts and Crafts, Specialty Foods, Nonstop Entertainment, Wine Tasting and more. 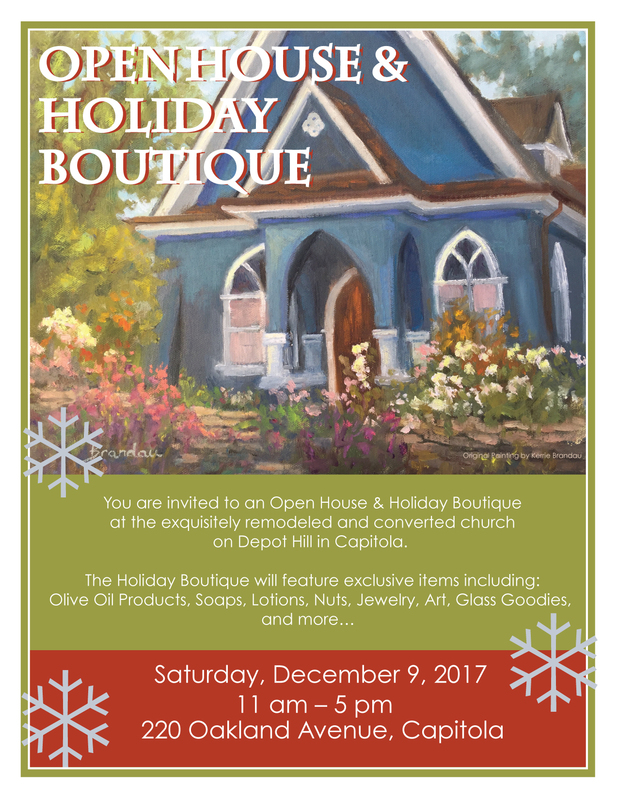 You are invited to an Open House & Holiday Boutique at the exquisitely remodeled and converted church on Depot Hill in Capitola. Have Carol speak at your next event. Fill out the form below and we will get back to you soon. Only someone who knows as much about the enormous benefits of this ancient symbol of life and longevity can appreciate the importance of giving the olive tree and all it offers tribute, as Carol Firenze does in The Passionate Olive.